At the beginning of this year,​ Dr. Shantanu Agrawal was selected to head the National Quality Forum, a not-for-profit, nonpartisan organization that aims to improve healthcare through quality measurement. The NQF also works closely with the CMS and endorses measures used in federal programs. 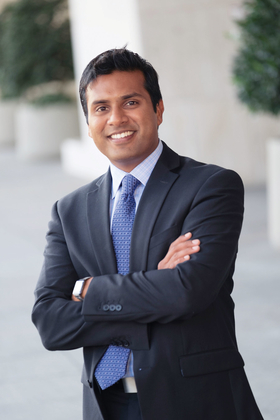 Agrawal joined the NQF from the CMS, where he was most recently deputy administrator and director of the agency's Center for Program Integrity. Agrawal recently sat down with Modern Healthcare safety and quality reporter Maria Castellucci to discuss his plans for the NQF including efforts to address social determinants of health, the opioid crisis and physician burnout. The following is an edited transcript. Modern Healthcare: You've been in the role of CEO for a few months now. What are your priorities for the National Quality Forum? Dr. Shantanu Agrawal:​ We really want to play a role in catalyzing health reform and payment reform. We've had an important role in that through our quality measurement and quality improvement work, and that needs to continue unabated even as we might be entering another round of reform. Second—and I personally feel very connected to this—is to better connect our work and mission to the front lines of medicine, whether that's on the clinician side or the patient side, to make sure that they are able to make more and better decisions around their own healthcare. We can sometimes play a more academic role, which tends to happen in scientifically driven organizations like ours. That is important, but we can also do more to bring that expertise and the outcomes of our work, or the products of our work, to the front lines. Third, there continues to be really important topics in the healthcare quality and quality improvement space that we need to play a leadership role on. A couple that come immediately to mind are social disparities or health inequity issues and the opioid crisis. Those are issues that I feel personally connected to. I did a lot of work on opioids while still at the CMS, and that continues to be a critical topic that NQF can impact. MH: How can the NQF address those two areas? Agrawal:​ On social disparities, it's clear that there isn't great data on characterizing or that help to characterize social disparities or health inequity issues, and at the same time there aren't great measures. So, that's clearly in our wheelhouse to convene experts and help to elucidate what good data sources might be or perhaps help to develop them from an advocacy standpoint and a scientific standpoint so that as a society we can better understand this issue. On the measurement front, there's an important question around risk adjustment and stratification that obviously has been an important policy question on the Hill, important in the government overall, and important to all our stakeholders. We have played an important role there and continue to do so, so that measures reflect the right approach. Our work inherently ties to reimbursement and payment incentives, so where we can help to improve measure design and bring the right risk adjustment or stratification approach, that will be a really important role. Opioids are a little bit of a different topic. There are nationally accepted guidelines that we have reflected in our measures, so it's not so much a data and measurement issue. The contribution that we can make is on building tools and resources to help providers and help patients make better decisions around opioid use. One thing we can do in this area and in a lot of others is launch what we call an action team to help devise solutions to address a particular challenge in healthcare. We did that around issues like antibiotic stewardship and shared decisionmaking. It helps to bring national attention to an issue and helps to create an actual tool that providers can use to make improvements. That's the kind of action we want to make on opioids as well. MH: A few months ago, the NQF recommended that HHS remove 51 of 240 quality measures that you didn't think added value. Could you talk about the challenges to ensuring that quality measures are actually providing value? Agrawal: This was a new activity for us. It was the first time that we looked at the entire portfolio of Medicare and Medicaid measures through the Measure Applications Partnership process and tried to identify those measures that we thought could be removed. We made those recommendations for two main reasons: either the measure itself wasn't the best measure anymore or the measure topped out and there wasn't enough variability in how providers performed on that measure. One of the challenges in measurement is to stay current, right? New evidence is being generated all the time; measures have to be reviewed periodically to make sure that they are still based on the best science. We do that in our endorsement work, so every measure gets reviewed at least every three years, if not more quickly. If some fundamentally important new science comes out, then we'll bring that measure back for review even more quickly. We're trying to bring that thinking to MAP as well. Performance variability is also central to the process. We won't endorse a measure if providers are essentially doing equally well on that measure; that's a philosophy we're trying to bring to MAP. As you noted, we recommended a 20% reduction in measures as a result of this kind of thinking. Our plan, very much in agreement with the CMS, is to continue performing that activity year after year so that MAP can be a place where it really is considering the most vital measures. There's this constant cycle of improvement. MH: What about quality measures and how they relate to burnout? Agrawal:​ That's a very important question, and I feel personally connected to it as an emergency room doc and having been on the receiving side of measurement as well. First, we should think of this more broadly than just the question of burden. The real question is, what are we requiring providers to do, and is there a good reason to require it? The good reason should always be actually improving care at the bedside, actually getting patients the kind of care and the value of care that they need. Where a measure isn't improving quality or doesn't have the potential to do that, the expectation on providers certainly starts to seem unreasonable and burdensome. There are a few things we can do. First, making sure that we are focused on the right kind of measures, that we're endorsing the right measures, that they are outcomes-focused, that they really give incentives for care coordination and integration, that they are focused on the issues that matter most to patients. More broadly, and frankly bigger than NQF, is helping to address the alignment question. Part of the unnecessary burden of measurement comes from small, or relatively small, differences in measure design. Two measures might look to assess the same thing, but they do it in slightly different ways. That can look small at the measurement level, but at the provider level, those kinds of differences can be really substantial. NQF has an important role to play in trying to bring more consensus and more alignment, but clearly that's a process that has to be driven by a number of other organizations as well, and if done correctly, could have a lot of impact on providers' lives and, frankly, patients' lives, to make sure that there's agreement on what good looks like. MH: Regarding patients and consumers, what sort of emphasis have you been making to ensure these quality measures actually are helpful for them? Agrawal:​ Transparency to patients and patient choice is really core to NQF. We involve patients, consumers, purchasers of healthcare at every level of our organization. They account for more than half of our board. They sit on every single committee, on every endorsement body, to ensure that the patient voice is being represented. Remember, all of this is being done to improve the value of care they're getting. So, anything that expands transparency for patients we consider a positive. One other big thing that we are working on is bringing more patient-recorded outcome measures to healthcare. There's a lot of agreement in the quality community that these kinds of outcome measures are critically important, but not many of them exist. Not a lot of them have been endorsed by us, and it's because actual patient-reported outcome measure design has been lagging. One of the things that we are trying to do through projects like the Measure Incubator is really catalyze the creation of these measures so that they can be used. I think that's the next big iteration of healthcare quality, so that the patient voice is not just kind of an end product but it is built into the quality measurement approach itself. MH: Were there any other topics you want to touch on? Agrawal:​ NQF reauthorization. We have a critical role to play. We're one of the few organizations where the patient literally sits at the table, every single table. We do a lot to drive the creation of the right measures, their implementation and the resulting improvement in healthcare. Our mission needs to continue, and folks need to understand that we get authorized by Congress, our funding comes from Congress and needs to be reauthorized this year. It would be great to have stakeholders get involved and ensure that NQF continues to drive quality improvement.